It’s the sixth book in the A Woman Lost series, and the previous book, A Woman Loved, ended with quite a cliffhanger. Lizzie has a unique family (read crazy), and while she’s doing her best to live a happy life with her wife and twins, her family causes so many problems. And the clueless Lizzie does her best to navigate the issues in Lizzie style, which means she makes many comical blunders. When you wrote the first book in the A Woman Lost series, did you know it would become a series? What kind of planning did you do? When I released A Woman Lost, book 1, back in 2013, I had no idea readers would fall in love with Lizzie. I didn’t have a series planned, but that’s what happened. One of the comments I receive the most from readers is they feel a connection to Lizzie. As a writer, that makes all the stress of producing a unique story worth it. The A Woman Lost series has a very strong family theme. What does family mean to you personally, and what kind of message do you want your readers to take away from the series? Lizzie has a difficult family situation, and what she learns over the years is family is what you make of it. Meaning family can be created not only from those related by blood, but friends who stand by you through thick and thin. I think it’s vital for people to find their own family, especially if their blood relatives aren’t supportive. There are so many good people in the world. Surround yourself with positive people to become the best person you can be. Valentine’s Day is coming up next week. What was the most romantic scene you ever wrote? Oh geez, that’s a tough one. The first chapter of The Fall Girl, the second book in The Miracle Girl series, comes to mind. JJ popped the question to Claire after they climbed to the top of Mount Kinabulu, a mountain in Malaysia, to view the sunrise. Do you have any quirky writing rituals or habits? I’m not sure I do. I can’t wake up and jump right into writing like many authors. I have to make a cup of tea and clear some admin tasks off my plate, or I can’t concentrate on the story I’m working on. Oh, before I start a novel, the idea has to sit with me for weeks. I spend a lot of time going for walks, letting ideas percolate. I’ll jot down notes, but I won’t actually write until I feel confident I can finish it. When I finally start, I have a decent idea where the story will go. But then, the characters hijack it, and even I’m surprised by what happens. You wrote several series, among them the A Woman Lost series. What’s the appeal of a series for you? What is harder to write in comparison to a standalone novel? I never intended to write so many series, but readers requested them and they’re my bosses. I like the challenge of fitting all the pieces and characters into complicated story arcs, all the while keeping everything fresh. I’m the type who loves to tackle puzzles. The harder the better. As for standalones, a writer is a bit limited by how much she can delve into the entire backstory. I’m a firm believer that emotions and actions are based on many revolving parts that keep evolving. And I love to get to know characters thoroughly to find out what makes them tick. I would be a seven-layer bar, which includes chocolate chips, butterscotch chips, nuts, peanut butter, graham crackers, coconut, and an ingredient I can’t remember at the moment. Like my writing, I like layers. You run the fantastic I Heart Lesfic, which I signed up for too. Can you explain what it is and where readers can subscribe—and why they should? I Heart Lesfic is a place for authors and fans of lesfic to come together to celebrate and chat about lesbian fiction. Every Tuesday, I send out a new release newsletter listing e-books and audiobooks. Readers love the newsletter and thank me for helping them discover not only new books by their favorite authors but also for helping them discover new up-and-coming authors. When I first started publishing, there weren’t many resources for lesbian fiction. I Heart Lesfic is my way of helping authors and readers find each other because this world can be lonely. To learn more about I Heart Lesfic, click here. I read just about everything, ranging from nonfiction to fiction. Usually, I have three books going at once, plus an audiobook for when I exercise. Since most reading this interview will more than likely have an interest in lesbian fiction, I’ll stick to recommending some lesfic. I’m a huge fan of Melissa Brayden’s Soho Loft series. I adore Clare Lydon’s sense of humor in her London Romance series. Harper Bliss’s Pink Bean series is endearing. And Miranda MacLeod’s Letters to Cupid was my favorite read of 2018. The next book on the publishing schedule is A Woman Undone, which will be a Valentine’s Day release if all goes according to plan. I’m still working on it. I’m plotting a book that I’m really excited about, but I’m sworn to secrecy at the moment. Readers can find me at I Heart Lesfic, on Twitter, and on my author website. And, if they want a free copy of A Woman Lost plus bonus scenes, they can sign up for my author newsletter here. T.B. 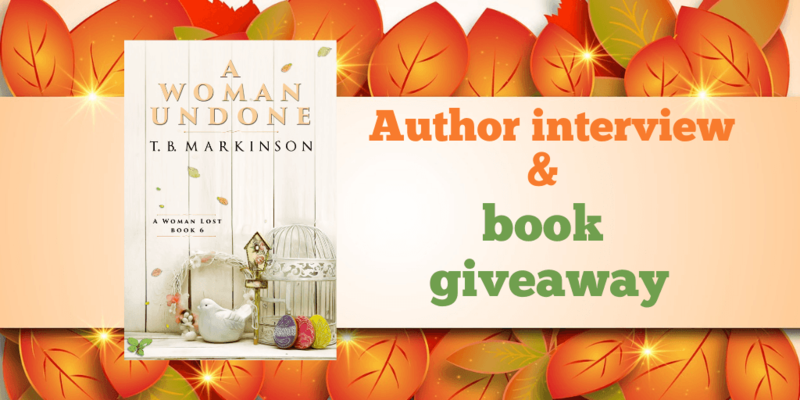 is giving away three ebook copies of A Woman Undone. Anyone can enter. To be entered into the drawing, leave a comment on this blog. Entries close on Saturday, March 2, 2018, 10 a.m. CET, when I’ll draw the winners using a random numbers generator. I’ll notify winners via email. Your email address won’t be used for any other purpose. I have followed T.B for a long time. I fined her work outstanding. I try to read everything she has as soon as i am aware of it. Wow, another series I’m going to have to get into! And I can’t wait for The Fall Girl audiobook!! Yes another series to get completely lost in. I really love TB’s work and the “A Woman Lost” series in particular. Thanks for the great interview! Great interview!! Love this series!!! Congrats TB on your newest book! I Heart Lesfic is one of my regular ‘go to’ sites for lesfic titles. Thanks for hosting the giveaway! Fingers crossed, I need this book! Great interview. I need to start reading “A Woman Lost” series. And I definitely need to check out I Heart Lesfic! I hadn’t heard of T.B before as an author, but her books sound wonderfully charming! thanks for sharing the interview, Jae! Great interview! It’s always interesting to learn a bit about the author and what’s to come. Great interview! It’s always interesting to find out a bit about the author and what’s to come. I just love T B Markinson! I love the series. This was a great interview, makes me want to read the series from the start. Just discovering TB and loving her writing so far. Haven’t heard of T.B. Markinson nor read any of her books. Thanks for doing the interview! I love authors who do series, and it sounds like you have at least 2 good ones going. Looking forward to checking them out. Your cookie sounds amazing! Thanks for the I heart lesfic newsletter I read it every week and as you mentioned, have found some new authors. I’ve really enjoyed your work, and love that you delved out into the co-author realm. a free book? yes please! I think I’m behind the 8- ball! I need to start reading this series!! I’ve been looking for a new series to read. This sounds perfect thanks! Nice interview and terrific author. Love her books. Hope I win one. I read a few reviews of books written by TB. I was so impressed that I am starting my first TB novel tonight. Love T.B. Markinson. I have followed her for some time and highly recommend her to anyone who listens. Congratulations on the new book coming out! I Can’t wait to read it! Such a great series. I am looking forward to Book 6. Thank you! Hey TB, you write awesome books which I have to read in one go only. Can’t wait to check this serious out! I love T.B.’s books and can’t wait to read the newest one!! I love the Woman Lost series and am so excited about Book 6!! I Heart Lesfic has introduced me to a lot of good books. I’m really glad it exists! I’ve never read one of her books before but after reading this interview I’m definitely going to put one on my list. Hope I win! Really enjoyed the interview. TB is one of my favorites, and I can’t wait for book 6! Thank you! I love the series and have been anxiously awaiting the next book! I have several of your ebooks and audible books, and look forward to the possibility of winning another! T.B. is an amazing author. This is a great series. Don’t have us waiting long for next installment. That‘s great, definitely need more of her books. Never have read anything from this lady and I WANT TO AND I HAVE TO (yup, I’m yelling). So this series is my next one, thank you! Great interview. Haven’t read anything from T.B. yet so would be a great start. Great interview, thank you for sharing it with us. Discovered T.B. recently through Jae’s Book Bingo und loo forward to her next book. Loved your interview – thanks! I so much enjoy everything TB writes, and cannot wait to read book 6 in this series! Subscribed to your mailing list and I Heart Lesfic’s newsletter. (I usually read I Heart Lesfic’s newsletter via a link from Women & Words.org but I subscribed too).